Despite the threat of nine counts of sedition and 42 years in prison, cartoonist continues to zing Prime Minister. If it is sedition to make serious fun of a demonstrably corrupt prime minister and his money-grubbing wife, we are with sedition all the way. In support of a courageous and daring individual, supported by an equally courageous news organization, we present a selection of Zunar’s cartoons. Posted in Cartoons, civil society issues, Critical Thinking, Democracy, Freedom, Human Rights, journalism, Kleptocracy, Najib Razak, Politics. Look at those high heel shoes of Malaysia’s Beauty Queen! Best wishes to all those who’ve done something – anything – in 2016 to deserve a happy New Year of 2017. And worst possible wishes to all the others for the decidedly unhappy New Year that they’re due for having deliberately done wrong or else failed in their duty to do right by their fellows over the past 12 months, or in many cases far longer, and have no intention of changing their ways. Of course in the former category I include a whole spectrum of people ranging from those who’ve strenuously striven to be outstanding human beings in their ordinary, everyday lives on the one hand, to heroic humanitarians and ferocious fighters for justice and human rights on the other. I’m conscious that I should be careful in naming any of the people or organisations I have in mind here, lest I cause offence to some by forgetting or not having sufficient space to include them, or else embarrass or endanger them through public exposure. Suffice to mention, then, by way of example, such friends and former colleagues as ‘Chemical’ Ali, Alice and her husband Stephen; fellow-travellers in the quest for truth, integrity and transparency in government, like the management, staff and most of the readers of Malaysiakini; literally countless fellow pro-democracy writers and bloggers like Azly (Rahman), Din (Merican), Mariam (Mokhtar), KJ (John), S Thayaparan and Zan (Azlee); and, last but as far as possible from least, the inimitable and unquenchable anti-regime cartoonist and lampoonist, Zunar. Some of the similarly countless organisations I can’t help thinking of as well-and-truly due the happiest-possible wishes for this and every other New Year include Malaysia’s Sisters in Islam, Sarawak Report and now sadly inactive Saya Anak Bangsa Malaysia (SABM), France’s Médicins Sans Frontières, Reporteurs Sans Frontières, Syria’s non-government civilian volunteer rescue workers, the White Helmets, and the International Federation of the Red Cross and Red Crescent. As for all those who are not due a New Year at all, let alone wishes for a happy one, the first lot I can think of, as long as I’m concentrating on Malaysia for this column, are the members, cronies and supporters of the ever-ruling UMNO-BN regime. As of 2017, this cartel of ‘criminals’ posing as a coalition government has enjoyed an unbroken run of 60 years of allegedly happily robbing Malaysians of their rights, freedoms and protections and their nation of its natural resources. Thus these political ‘predators’ deserve to rot for years in prison, not to be wished, let alone allowed another happy year in power at the public’s expense. All the signs are there, however, that they have every intention of celebrating in 2017 as happily for themselves and as unhappily for the people as they did in 2016 and for decades before. 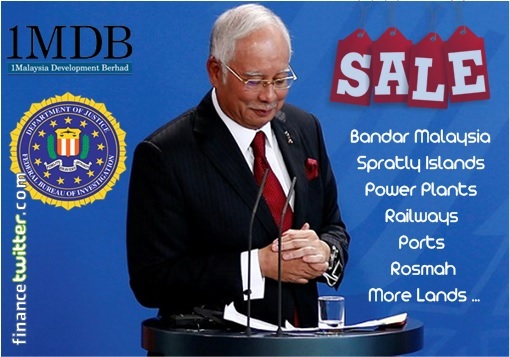 Prime Minister Najib Abdul Razak continues to avoid and evade the fact of, let alone his responsibility for, the massive 1Malaysia Development Berhad (1MDB) brouhaha. And his cabinet ministers and other sycophants, supporters and apologists are still solidly behind him in his campaign of denial and deception. Meanwhile the regime has even more daylight robberies in train. Literally, as in the case of the allegedly monstrously over-priced MRT rail system currently under construction. So rather than yet another happy year, I, along with the majority of Malaysian citizens, I suspect, hereby wish UMNO-BN a decidedly crappy or even accursed year. In the fond if admittedly faint hope that the US Department of Justice will finally bring criminal charges against Najib and his accomplices in the 1MDB imbroglio; or that Najib will call the 14th general election (GE14) and that Chinese numerology will come to the party and make sure that for UMNO it turns out to be truly ‘forever die’. And then there’s always the chance that the RAHMAN prophecy will come true, and Najib’s fall will finish off BN forever. But of course it’s not only Najib and UMNO-N who are well and truly due, in fact way overdue, for a deservedly unhappy New Year. There are also Bashar al-Assad, his murderous regime and its brutal Russian allies, for example, who are due endless retribution for five years of slaughter of the Syrian people and destruction of their homeland. Then there are the likes of Islamic State, al-Qaeda, Boko Haram and all the other similar death-squads, many of which have been happily getting away with their crimes against humanity for far too many years. And finally, who knows whether to wish the US and its citizens a Happy New Year? With president-elect Donald Trump just weeks away from being sworn-in to office, it’s anybody’s guess how 2017 will turn out for ‘God’s Own Country’ and the rest of the world. Given Trump’s stated intention of greatly beefing-up the US’s arsenal of nuclear weapons, chances are that rather than a Happy New Year we could well find ourselves facing the unthinkable horrors of a Happy Nuke Year. In which case the displays of fireworks on which Sydney and so many other cities squander such a fortune for the sake of celebrating the New Year could this time around portend the possibility that far more serious and deadly global or regional fireworks, or at least a decidedly dangerous arms-race, may be due in the very near future. Posted in 1MDB Financial Scandal, Cartoons, Character and Integrity, Corruption, Democracy, Economics, Fiscal Management, Foriegn Affairs, Governance, Kleptocracy, Leadership, Money Laundering, Politics, Rule of Law, UMNO Politics, UMNO-BN. These are the words of Zulkiflee Anwar Haque, a cartoonist who goes by the name Zunar and who is facing charges under Malaysia’s Sedition Act and a possible 43 years in jail for speaking out against his government. Printers and suppliers of his work have been harassed, with his office raided several times. 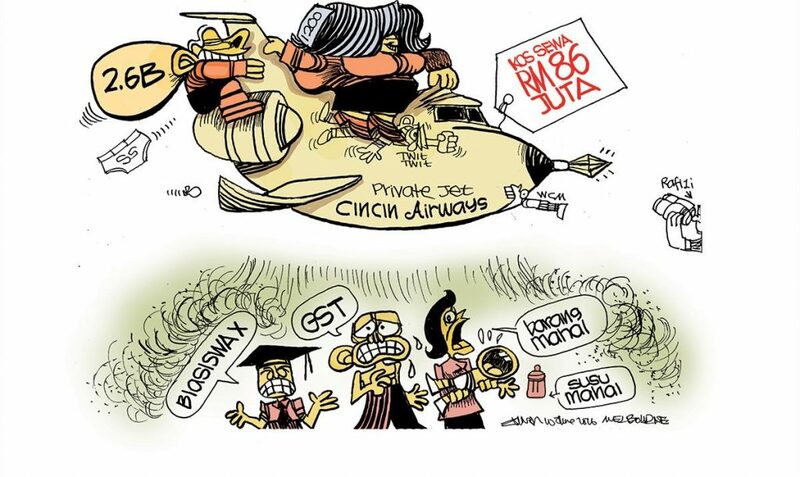 Zunar is also one of the few Malaysian cartoonists to target public figures, including Prime Minister Najib Razak, and address issues like corruption and abuse of power. But is he a serious threat to national security or even the stability of the Malaysian government? In this interview for New Mandala Zunar chats to Dr Ross Tapsell about freedom of expression in Malaysia, his work and pending sedition charges. Posted in 1MDB Financial Scandal, Cartoons, Civil Rights, civil society issues, Democracy, Freedom, Human Rights, Liberty, Najib Razak, Politics. As much as we like to say that Malaysia is where free speech goes to die, we can’t deny that we’ve seen some progress in expanding our democratic space. Twenty years ago, things would have had to become really bad to motivate activists to start waving their flags and risk instant arrest. This came from a lack of real organisation and an equal lack of easily accessible mass communication technology. These days, no one is safe any more. More often than not, those in power can expect their screw-ups to spark mass texts on WhatsApp calling on protesters to gather at Jalan Raja Laut at 1pm next Sunday. Social media has become an even bigger bludgeon to hit errant authorities with, and Malaysian millennials are making full use of it. The work of punk artist Fahmi Reza is a good example of this. His graphic, Instagram-friendly brand of street activism has perhaps contributed to the Malaysian public’s awareness of issues more than has any other agency next to Bersih, with his famous clown caricature of Prime Minister Najib Razak receiving international media attention. All of this has been helped by the vibrant do-it-yourself branding campaign he’s been running on his Facebook and Instagram accounts. It’s a movement in itself, one which has seen his personal hashtag #kitasemuapenghasut in full use by his followers and his trademark clown-Najib posters pasted all over the country. It’s millennial activism at its best. You can deny it, you can call it hashtag activism, but the fact remains that awareness of political and related issues among Malaysian youth is at an all-time high. We’re in the best place we’ve ever been for Malaysian activism and, who knows, it may get better. Of course, that depends on whether civil society maintains its pressure on the authorities. Our progress didn’t happen in a vacuum, after all. It happened through years of struggle. “The Police are better now, but change didn’t come from themselves. It came from civil society. With groups like the Bar Council, Suhakam and Suaram all speaking up, the space opened up,” said Parti Socialis Malaysia (PSM) Central Committee member Michael Jeyakumar recently in a comment on this year’s May Day rally in Kuala Lumpur, which saw the participation of about 500 people. It was a small demonstration and it lasted only two hours. On those two scores, you could say that the rally was not a success. But considering the relative lack of police response, it’s a pretty good marker of how far activism has progressed in the past twenty years. Posted in Bersih 4.0, Cartoons, Civil Society, civil society issues, Democracy, Freedom, Governance, Human Rights, Justice, Politics, Rule of Law. Images of Prime Minister Datuk Seri Najib Razak dolled up in chalk-white makeup, with a bright red gash for a smile and neon green (or occasionally lush orange) hair, greet visitors to the Facebook community page called Grupa. It is an acronym for “Grafik Rebel Untuk Protes & Aktivisme”, or “Rebel Graphics for Protests and Activism”, which brought together several graphic designers and digital artists to design posters for last year’s Bersih protest in Kuala Lumpur. Now, they have set their sights on a new project: flooding the social media with pictures of a clown-faced Najib – sometimes grinning, sometimes sad, and sometimes with a rose dangling from between his lips – along with the hashtag #KitaSemuaPenghasut (we are all seditious). In Malaysia, where an award-winning cartoonist was censured for drawing satirical comics on the Prime Minister and his wife, Grupa’s antics are more than just a colourful dig at Najib. They told The Malaysian Insider they were risking arrest to stand up for fellow graphic artist Fahmi Reza, who posted the first clown caricature of Najib on his own Twitter on January 31, and promptly attracted police attention. It was in response to the Attorney-General’s decision to close investigations into the RM2.6 billion found in Najib’s personal bank accounts. Not impressed, the newly-set up Twitter account for the Police’s Cyber Investigation Response Centre (@OfficialPcirc) warned him that he was being watched. “My first reaction was shock,” Fahmi told The Malaysian Insider as he recalled receiving the tweet. But that feeling quickly turned to outrage when he read its tweet, especially the words “Gunakan dgn berhemah&berlandaskan undang2” (use properly and in accordance with the law). Defiant, Fahmi immediately wrote a post on Facebook in Malay, which translates to, “In a country that uses laws to protect the corrupt and oppress those brave enough to speak out, it is time we abandon all niceties when fighting the corrupt rulers”. He also posted another satirical artwork on Twitter, using the police’s words against them in the caption, along with the hashtag #BigBrotherIsWatchingYou, an ode to George Orwell’s 1984. The activist, who recalled his arrest 12 years ago for drawing a poster on police brutality, didn’t expect the Internet’s graphic artist community to rise up with him in solidarity this time around. The #KitaSemuaPenghasut movement was a “new wave graphic rebellion against the Old Order”, he said, and the response has been overwhelming. “It was beyond my expectations. It proved to me that I was not alone. There were others who share my outrage.In the past, graphic designers have largely kept themselves out of the limelight when it came to politics and activism. Grupa is a breath of fresh air,” said Fahmi. On Grupa’s Facebook, fresh caricatures of Najib are posted every hour, and social media users are lapping it up.”Make a shirt of it, I’d buy it,” urged Facebook user Apisz Fumi in the comments section. “That is one frightening image,” observed Richard Lee, to a digitally edited picture of Najib baring rotten, bleeding teeth and a cheerfully bright red clown nose. Grupa said the movement came about when they decided to produce clown-faced posters of Najib to show solidarity with a fellow graphic artist and disgust at the ruling class for “constantly abusing the law”. “We started releasing several posters on our Facebook page and before we knew it, we even had the public submitting their own versions of Clown Najib to us. To date, we have released 46 posters depicting Najib as a clown,” the group said, adding that they received dozens of paintings from “the citizenry” a day through email. But the group, as well as Fahmi, risk running afoul of the law, more specifically Section 233 of the Communications and Multimedia Act 1998. A conviction could land the artists a fine of up to RM50,000, a year’s jail, or both.And as if to drive this point home, @OfficialPcirc’s only tweet since issuing the warning to Fahmi comprised an image breaking down that same law. But the prospect of having the police cyber unit clamp down on them doesn’t seem to perturb Grupa, even though they risk courting more trouble than Fahmi, given the flood of caricatures on their page. 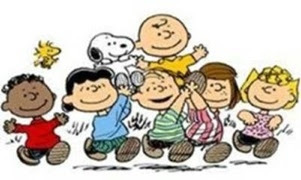 They said they were frightened of just one thing: being trampled over should they not voice out. “So far, no authorities have contacted us, but that may change. We are looking forward to it,” they added. For the time being, the group plans to continue sharing clown images of the Prime Minister as long as it believes citizens are being repressed and denied their right to free speech and freedom of expression. Besides receiving Facebook likes and shares, they gained international publicity with a BBC report on them titled “PM left red nosed by censorship protest”. Grupa said they were left “humbled and surprised” by the attention. “We didn’t expect it to go big…Actually we did lah, I mean, you mess with freedom of expression this is what you get lah, blowback,” they quipped. And he is confident Malaysia’s #KitaSemuaPenghasut movement will herald a change in society. 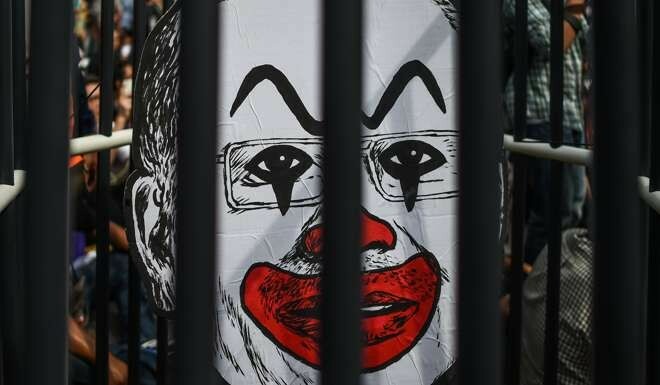 “The outpouring of solidarity posters from graphic artists with their own versions of a clown-faced Najib despite the police warning against it was a clear act of defiance and represents a shift in the way ordinary people react to police intimidation. Posted in Art, Cartoons, civil society issues, Critical Thinking, Democracy, General, Uncategorized. Artist and activist Fahmi Reza has warned police against arresting him over his artwork depicting Prime Minister Najib Razak as a clown.In an open letter posted on his Facebook page today, Fahmi said his arrest would only get him more publicity and draw more attention to his art pieces. “With all due respect, I hope the Police would not make a rash decision to arrest me, following the Police report lodged by Ali Tinju and the Red Shirts movement against the poster I shared on social media. As you know, the poster was a satire based on current issues, which is protected under Article 10 of the Federal Constitution, which guarantees ‘every citizen the right to freedom of speech and expression’,” he said. Fahmi recently received a warning from the Police for uploading a caricature of Najib as a clown, as part of a campaign against the Sedition Act. In lodging a police report yesterday, Ali Tinju, whose real name is Mohd Ali Baharom, said Fahmi’s artwork had caused “public outrage” and could influence the rakyat to hate the Prime Minister. Fahmi, however, said that if he was arrested, it could draw more visitors to his social media accounts and would inspire more people to rebel, become more aware of their rights, and be unafraid to speak up against corruption, injustice and oppression. Posted in Art, Cartoons, Democracy, Freedom, Human Rights, Liberty, Malay Fascists.